It’s the question many animal lovers ask themselves when they see the photo of a homeless cat or dog in an animal shelter photo. Recently, I saw a large “no-kill” shelter in Texas post a photo of a young Pit Bull mix on their social media page. In addition to taking in animals from high-volume, open-admission shelters, the no-kill facility has about 150 people on their waiting list to surrender a pet, and in what was likely an act of frustration, they posted the photo, along with a message geared towards making the person who surrendered the dog feel guilty. When I publicly asked the question of why they would take that approach, defenders came out in droves. I’d like to clear a few things up for everyone out there who hasn’t worked in animal sheltering. Shaming is never an effective way to accomplish anything. “Not cute anymore,” is not anywhere on the top 10 reasons why people surrender animals to shelters. And no, 99 percent of people would not live in their cars. I have no doubt many people would make sacrifices for their pets, but this week, where I live in Virginia, it will be an average of 86 degrees. If you have children, social services would want to have words with you, presuming they are also living in the car. And if you needed to, say, use a public bathroom, or go into your job, or buy groceries, where would the dog go during the heat of the day? I am not saying this is impossible, and I know it has been done. However, I am willing to venture the vast majority of people who shout this expectation, have not actually thought through the logistics. So, what does that mean in terms of reducing the numbers of animals coming into our shelters? Spay and neuter continue to be critical, however; many people who ultimately re-home their pets, do so as a last resort, and because they are either unaware of resources, or do not have access to what they need in order to keep their pets. But Pets for Life is setting out to change that. The Humane Society of the United States started the program to help preserve the animal-human bond for an estimated 23 million pets living with families in poverty. Recognizing there are “resource deserts” in low-income communities, Pets for Life is an outreach program that meets pet owners where they live, to offer information on spay/neuter, pet health, and make connections for pet-owning families with the programs that can help keep these pets in their homes. Pets for Life is not about handouts, it’s about empowerment and trusting pet owners to make great decisions for the animals they love, simply by offering engagement without judgment. The model has proven so successful that Pets for Life now has staff in five major metropolitan areas and dozens of official mentorship communities. And it has inspired people across the country to start similar programs to help those in need. I admit, that I once questioned the effectiveness of this campaign. While I was working at Espanola Valley Humane Society in New Mexico, our veterinarian, Dr. Carolyn Fletcher started the Pet Amigos program, inspired by Pets for Life. However, our shelter had been offering free spay/neuter for years and there were days when we cancelled surgery staff because we could not fill the appointments. So what did this non-judgmental outreach project teach me? With two part-time bilingual staff going door-to-door in our town, Pet Amigos was able to sign up more than 400 pets for spay and neuter surgeries in less than a year. When people did not have transportation, Pet Amigos helped arrange it. When they saw dogs living on chains, the team talked to the owners about trolleys and shelter. And I have seen first-hand that these pet owners now trust the shelter and its staff in a way that never seemed possible before. The change has been real, and I am a convert. This isn’t charity, this is outreach, and it was a major hole in our efforts before. 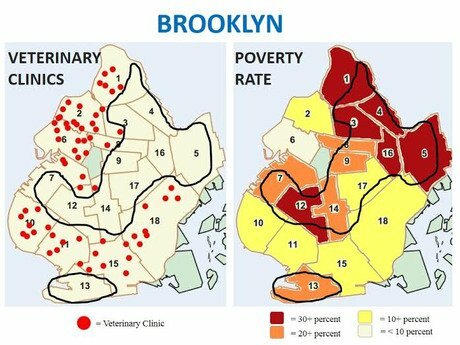 In New York, Kim Wolf, founder of another Pets For Life-inspired program, “Ruff Riders,” has also discovered an unexpected advantage of direct work with pet owners in low-income communities: People within these areas have created an informal rescue network to keep animals out of shelters. I am not an easy person to convince, but I realized I was waiting for the people in need to come to me, and by that time it is often too late to make change. Pets for Life has created a model that is easy to follow and the results are nothing short of awe-inspiring. Saving the lives of shelter pets starts with keeping them from being surrendered in the first place. How can you help? Download the Pets for Life toolkit and bring it to your local shelter. Offer to start an outreach program. Show the people in your at-risk communities you care about their pets, but more important, that you care about them. And be prepared to question everything you thought you knew about pet owners in need.